This week, Brevard College and the Brevard Music Center are collaborating to offer a new summer choral intensive for high school singers. 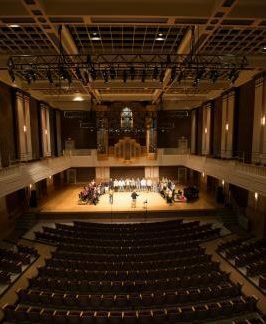 The inaugural Brevard Choral Institute culminates in a free concert Saturday, July 2, at noon in Dunham Music Building’s Ingram Auditorium at Brevard College. “This Institute is a very exciting example of the continuing collaboration between our two institutions,” Gresham said.The program will feature Eric Whitacre’s “Five Hebrew Love Songs,” to be performed with string quartet; Italian and French madrigals; and some contemporary American selections. A few members of the Brevard Music Center High School Voice Program will also perform solos with BMC faculty pianist Janice Murray. 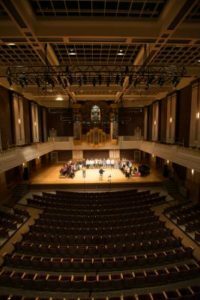 The Brevard Choral Institute is a week-long program led by Gresham, who serves on the faculty of both the College and the Music Center. Students have enjoyed daily rehearsals, classes with Brevard College faculty, forest outings and leadership exercises, and several concerts at the Brevard Music Center. The Institute serves as an opportunity to offer high school students a distinctive choral training experience that mimics the Brevard College experience by providing an intimate learning environment that purposefully engages learners. The Brevard Music Center, a summer institute and festival, teaches gifted young musicians to prepare and perform great musical works at a high artistic level. Learn more at brevardmusic.org.